QuoteSoft FabShop is a custom software solution designed for manufacturers of sheet metal ductwork, spiral pipe, and fittings for the HVAC industry. Adaptable for your company needs to produce and track quotations for rectangular, spiral, and oval duct fittings and accessories for complete and accurate quotations. Preparing accurate takeoffs requires a tremendous amount of knowledge, formulas, materials, specifications, labor rates, and factors. Finding people with the right skills is not easy. QuoteSoft offers an alternative. 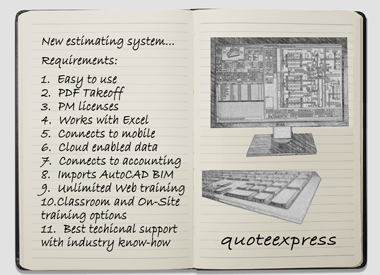 By customizing QuoteSoft with the knowledge of your estimators into company-standard data tables, takeoff can be done by part time or entry level estimators and or project managers and your staff can focus on working the crucial takeoffs that will ensure winning profitable jobs and improving the bottom line. Input rectangular, round, and oval ductwork, pipe and fittings. Connects to AutoCAD & Revit to import duct, spiral pipe and fittings. Downloads to your Plasma for automatic fitting input. Links to your accounting software for invoicing and project planning. On-Screen input of PDF files for stripping drawings. iPhone and iPad client software. | Windows, Web and Android client software. With our phone and web set up and customization of your software is included to get you up and running. Our training and implementation is the best in the business. 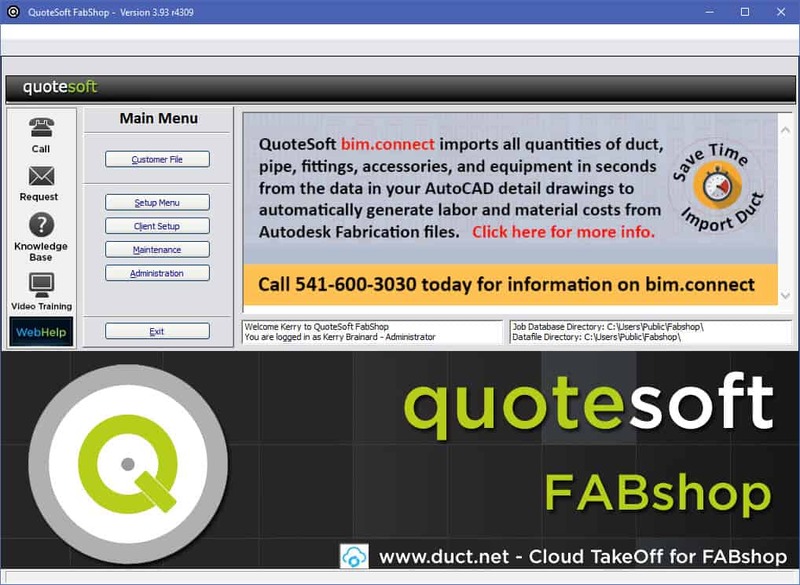 QuoteSoft FabShopweb and mobile data, CAD, cloud upload, download integration. The application includes automatic scaling, PDF and CAD file integration, and Excel integration, mobile device takeoffs, visual assemblies, and digitizer integration. QuoteSoft FabShop software has broad custom integration capabilities and is able to transfer data to BIM, Plasma, Sage Timberline, Viewpoint, QuickBooks, AutoCAD, and Excel and many others. We customize QuoteSoft to fit into your workflow. FabShop allows you to enter over 600 items of ductwork an hour. FabShop allows you to enter and markup from a PDF drawing or paper plan. FabShop allows you to download to your custom plasma cutter. FabShop reads AutoCAD BIM files for automatic estimates. FabShop is software… No internet connection is required to do a takeoff. Remove the guesswork from your sales performance. FabShop’s standard administrator reports help you accurately measure estimator and customer performance data. Works with the systems you already use. Connect directly with customers and field personnel Send your lists of ductwork, fittings, spiral pipe and accessories to your own shop or ANY fabricator from any location using your computer, tablet, iPhone, iPad, or Android smartphone. iQduct standardizes input of all spiral pipe, ductwork, fittings so there is a one-to-one connection with the shop. Eliminate hand sketched, fax lists, and box top shop orders. iQduct Mobile Takeoff for iPhones, iPod, allows you to add ductwork, spiral pipe, fittings and ductwork accessories to a job on your Apple device anytime. It automatically uploads your item data to the cloud for retrieval into your QuoteSoft Fabshop workstation. iQduct HD Mobile Takeoff for iPad, allows you to add ductwork, spiral pipe, fittings and ductwork accessories to a job on your Apple device anytime. It automatically uploads your item data to the cloud for retrieval into your QuoteSoft Fabshop workstation. FabShopWindows Web-Client Add-On Module Makes it Easy to Sell Duct and Pipe 24/7 over the Web. FabShop Windows Web-Client software allows you to automatically generate quotes from takeoffs over the Internet! The FabShop client is installed at the contractor’s site. 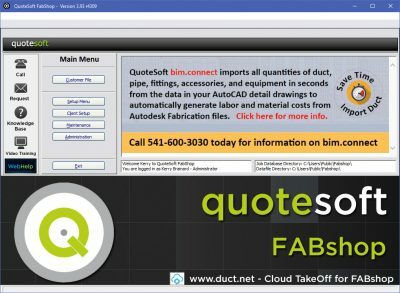 The contractor simply does the takeoff with FabShop Web-Client, then it automatically sends the information to your FabShop server for automatic quote generation. FabShop Web-Client can either automatically return a quote to the customer by e-mail or fax or notify a salesman that a quote has been processed. FabShop Web-Client software users simply point and click to input ductwork, fittings and accessories. Users can easily integrate FabShop information into their workflow to streamline their estimating processes. The FabShop client has everything a contractor needs to retrieve quick quotations from you for rectangular, spiral, and oval duct, fittings and accessories. Internet data transfers also permit you to use their own fittings and ductwork information in the automatic quotation. It’s so easy, your customer will always go to you first for a quote. FabShop Web-Client allows you to automatically generate quotes from your customer input over the Internet. 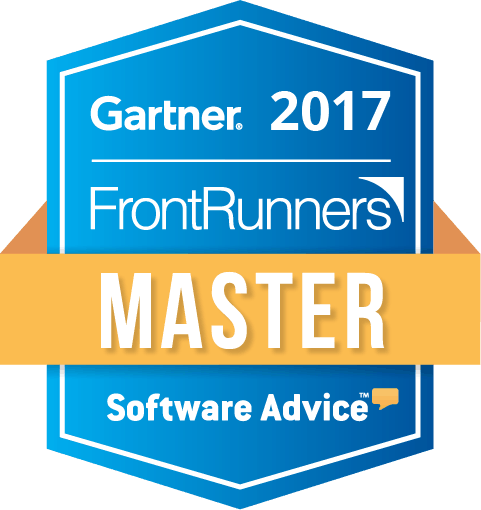 QuoteSoft offers a built in solution. By customizing FabShop Web-Client with the knowledge of your specifications and pricing into Web-Client data tables, ordering and estimating ductwork and accessories can be done by your customers’ estimators and project managers and priced and quoted automatically. Your customers have the ability to estimate jobs, order fittings and components – 24 hours a day, 7 days a week – using the existing FabShop data from your database. Customize your FabShop Web-Client with your company’s logo, your specification and fitting selections, and a link to your company phone number and website. No more fax lists or verbal lists of duct, spiral pipe and fittings. 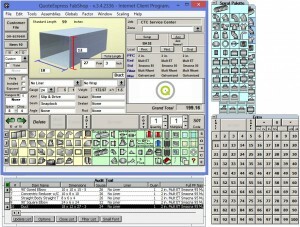 FABshop Web-Client input standardizes all fittings and ordering. Orders can be sent to directly your plasma for processing with FabShop Plasma Connect module. FabShop Web-Client can either automatically return a quote to the customer by e-mail or fax or notify a salesman that a quote has been processed. FabShop Web-Client software users simply point and click to input ductwork, fittings and accessories. Users can easily integrate FabShop information into their workflow to streamline their estimating process. The FabShop Web-Client has everything a contractor needs to retrieve quick quotations for rectangular, spiral, and oval duct, fittings and accessories. It’s so easy, your customer will always go to you first for a quote. FabShop Web-Client has all the features and flexibility to help you bid and win more jobs. Bid the way you want to, using the most flexible, adaptable, and proven estimating system available today. The Fabshop Windows client is installed at the contractor’s site. The contractor simply does the takeoff with Fabshop client, then sends the information to your Fabshop server for automatic quote generation. FabShop can either automatically return a quote to the customer by e-mail or fax or notify a salesman that a quote has been processed. FabShop client software users simply point and click to input ductwork, fittings and accessories. 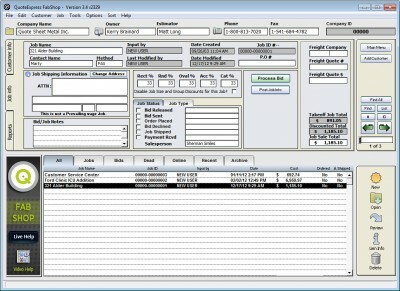 Users can easily integrate Fabshop information into their workflow to streamline their estimating processes. The FabShop client has everything a contractor needs to retrieve quick quotations from you for rectangular, spiral, and oval duct, fittings and accessories. Internet data transfers also permit contractors to use their own fittings and ductwork information in the automatic quotation. How do I get FabShop on my computer? 1. Call your ductwork fabricator and ask if they use FabShop If they do, you can download it directly from them. If your fabricator does not have FabShop ask them to get it. Integrated into the FabShop program, the Web, Android, iPhone and iPad Internet clients will allow contractors to input all rectangular ductwork and fittings, spiral pipe and fittings oval pipe and fittings, and ductwork accessories for an automatically generated quote. FabShop is available with the Internet client as an option. All FabShop programs can be updated at any time to utilize the Internet client. For more information on FabShop HVAC Software click here or call 800-813-7020.